Due to different causes birds can suffer from a cardiac insufficiency or a cardiac defect. 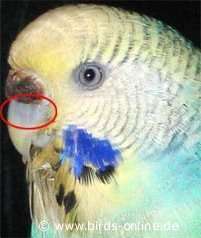 Besides budgies also all other bird species can be affected by this disturbance of health. Usually cardiac insufficiencies affect older birds who have been healthy and fit when they have been younger. On the other hand cardiac defects are congenital and can therefore also affect young birds. Also it can happen that a healthy older bird comes down with a heavy disease that damages the heart. The after-effect can be a cardiac insufficiency or a cardiac defect. Since cardiac insufficiencies and defects can differ in their appearance there is a variety of possible symptoms. Therefore it is very important for a bird owner to know each individual and observe the birds each day. Often marginal changes in their behaviour can be observed and these changes sometimes are helpful when you want to draw a conclusion from them. Birds who suffer from any cardiopathy should be brought to an avian vet as soon as possible because any disease that is detected in an early stage can be healed easier than an illness in an advanced stage! One possible symptom is shortness of breath (for example during flight), an accelerated respiration (sometimes even when the bird rests), reduced joy of flying around or an abnormal fatigue. It is the heart that pumps the blood through a bird's body. When the myocardial muscle becomes weak due to an illness it isn't strong enough to pump the blood into the tips of limps. A disturbed blood flow which mainly affects the birds' feet and toes is typical for this situation. The skin turns blue after any physical training (e.g. flight) and the toes become colder. Also a dramatic change of colour can be seen when you look at the beak. It's not properly supplied with blood and therefore turns pale when the bird is exhausted from flying or something similar (see photos below). suffering from a cardiac insufficiency. All mentioned symptoms may appear but there is no strict rule and it's also possible that you can just see one of them. They can be clues for a cardiopathy but can also hint other diseases. Therefore it is very important to contact an avian vet in case your feathered patient is suspected of suffering from a cardiac defect or insufficiency. There are many different possible causes that could lead to a cardiopathy. For example in case a bird is not allowed to train his muscles (no flight) and beyond it gets too much food/wrong food the animal will gain too much weight. Overweight is dangerous for the heart and therefore the described way of living is unhealthy for budgies. Certain inflammations inside the body can infect the myocardial muscle in case the initial disease remains undetected over a longer period. A damage of the myocardial muscle leads to a cardiac insufficiency or even to a heavy permanent damage. Also a deficiency of nutriments over a longer period (several weeks) or a poisoning can damage the myocardial muscle. A serious disease from which a bird suffers for several weeks or even months weakens the body itself and can therefore cause further problems. Besides this, a side-effect of a drug can harm the myocardial muscle. Particularly young birds who are up to one year old can suddenly die because of a congenital cardiac defect. This is one of the most common causes of death in adolescent budgies. How does the avian vet determine a heart disease? Often the avian vet can determine a heart disease by auscultating the bird with a stethoscope. Some vets or alternative practitioners don't need e stethoscope, they hear cardiac arrhythmia when they take the bird in their hands and then put an ear on the animal's breast. In fact birds who suffer from cardiac disease often show such cardiac arrhythmia. By carefully watching the bird's appearance in total, e. g. the colour of the skin or of the beak, one can find out a lot about a bird's heart. 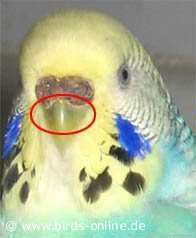 The reason for this is that a disturbed blood circulation causes blue skin and a darker colour of the beak. In specific cases only a radiograph can show a heart disease or the cause for it. At first an avian vet has to examine the bird and find out exactly what causes the heart disease. Of course also some traditional healers who are specialized in treating animals/birds can do such an examination. Regrettably, in most cases it is not possible to heal a damaged heart. But with by using the proper drug the health status of an affected bird can be improved a lot. It depends on the cause of the heart disease which drug should be chosen. Also some homoeopathic preparations can relieve cardiac diseases. In particular overweight birds suffer from heart diseases (caused by the wrong nutrition) have to eat less fat. It is very important to prevent any kind of stress if a bird suffers from a cardiac disease! Each kind of excitement could kill the bird! Nevertheless one should immediately consult an avian vet in case an animal is suspected of having a heart disease. Of course this causes stress, but it is necessary to find out the causes for the cardiac disease. Without a proper diagnosis it's impossible to improve the health status of a sick bird. Maybe you can prevent stress by a home visit of the doctor.